Increasingly year-on-year health and safety management is incorporating lots of statistics that are recorded, monitored and reported on a regular basis using health and safety software. This software improves management and ensures things are not forgotten, particularly if like Smartlog, risk assessments automatically assign tasks to individuals and remind them via email so that they take corrective action. On the other hand it can be considered that too much focus on statistics, in particular risk scores in a risk matrix can hide certain hazards by focusing on other hazards due to their numeric values. Moreover whilst statistics and reporting are great to measure progress and identify frequently occurring accidents, it is evident that the majority of time in health and safety management should be on prevention by design, planning and training. 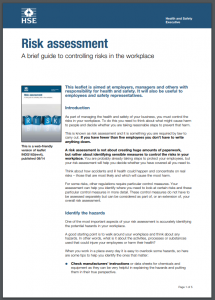 Whilst risk assessments that feature risk scores can list a multitude of different levels of hazards for identification and review purposes, they create confusion over what is the most likely to happen and what is the highest severity of harm, as peoples’ perceptions of risk and severity differ. Risk assessment categorisation of risk focusing on likelihood and injury severity together under the term priority and then setting normal or high priority is a better system as issues are fixed quicker based on priority and not based on the subjective aspect of severity which is circumstantial in every case. For example tripping on the stairs because of a worn surface can be unlikely and can often only result in minor injury accidents however it can also result in death; this highlights the potential issue with risk scores in a risk matrix which might rate this with a low numerical value for both likelihood and severity. 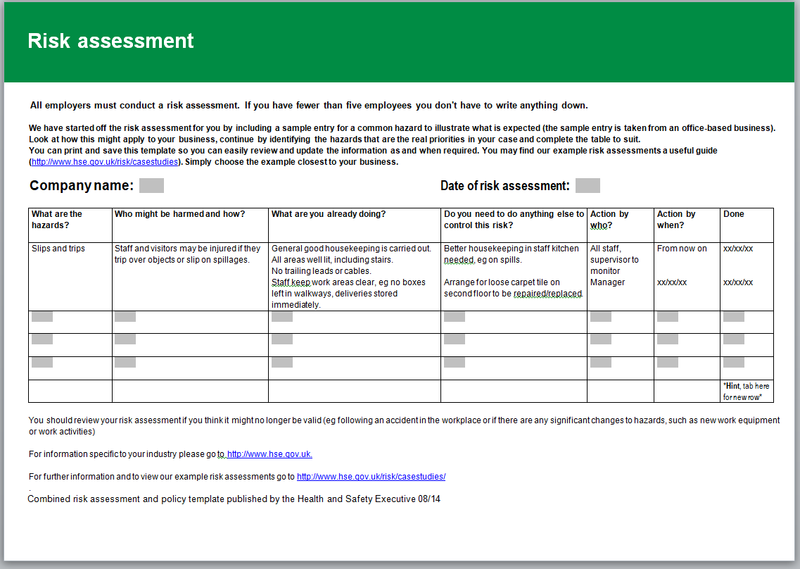 In health & safety management risk scores and the risk matrix structure could be considered as a 20th century management tool originating from paper based risk assessments as a way of highlighting risk within the lines and columns on a paper risk assessment to decide which should be considered first. With 21st century cloud based health and safety software like Smartlog, risks are automatically moved to the top a priority action list and removed when they are resolved. Today’s quick priority identification and resolution via software means it is questionable what purpose risk scores achieve in today’s era of health and safety management with quick software that can facilitate quick corrective action if it’s designed that way. The concept of risk and risk assessments has a long history. More than 2400 years ago the Athenians offered their capacity of assessing risk before making decisions and over the years it has become central to keeping people and operations safe. The introduction of The Health and Safety at Work etc. 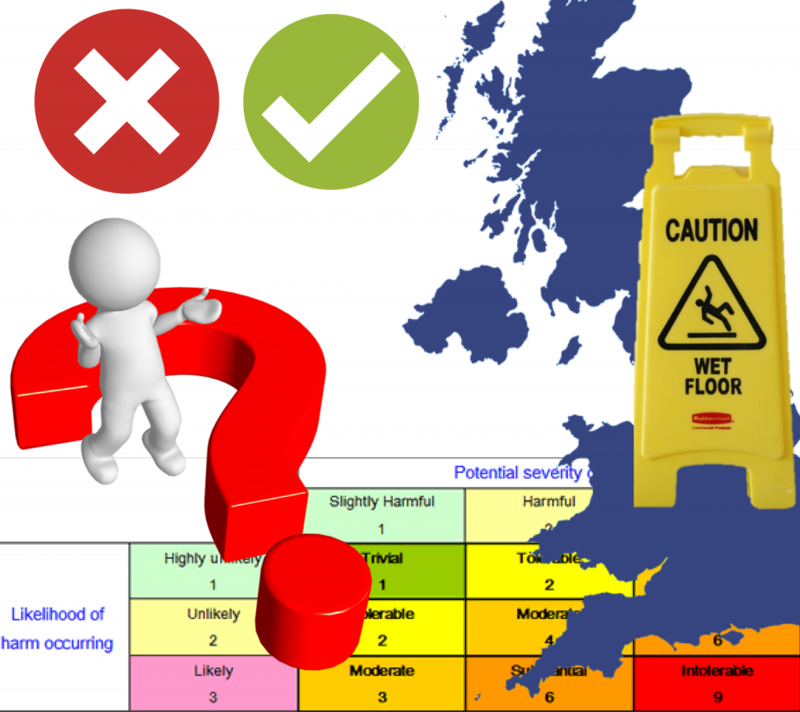 Act 1974 and The Management of Health and Safety at Work Regulations 1999 introduced documentation and management rules however there is no mention in these two pieces of legislation about the use of risk scores or a risk matrix in risk assessments. ‘Most businesses will not need to use risk matrices. However, they can be used to help you work out the level of risk associated with a particular issue. They do this by categorising the likelihood of harm and the potential severity of the harm. This is then plotted in a matrix (please see below for an example). The risk level determines which risks should be tackled first. The HSE explicitly mention here that getting risk scores wrong can result in failing to take important control measures. This is the issue and danger with using risk scores. 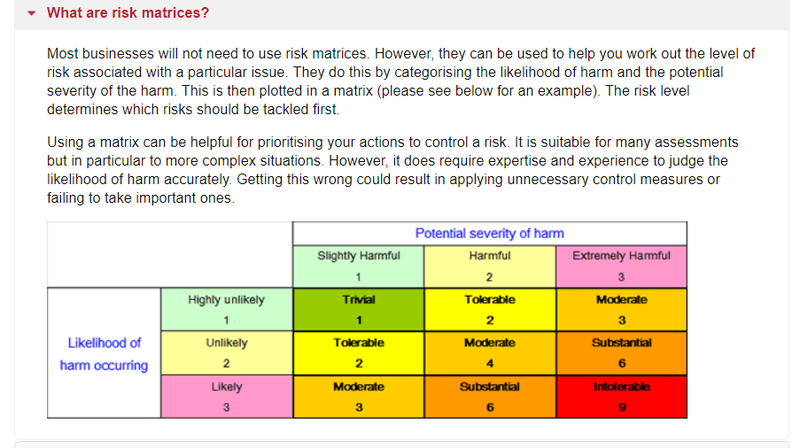 The image of the risk matrix shown in the HSE’s mention of risk matrices on their website shows the complexity and subjectivity issue of deciding on a combined numeric value and colour for a risk. This is an example of a 3×3 grid matrix; when a grid gets larger e.g. 10×10 there can be the possibility of even more confusion, differences in opinion and lack of consistency in scoring amongst people. Similarly the author of the article also presented a presentation named ‘What is significant risk?’ at the 11 February 2014 IOSH London Metropolitan Branch Meeting. This presentation sought to highlight the issues and over complexity of quantitative risk assessment (QRA) risk matrices based on risk scores amongst IOSH members. Moreover the same author mentioned in another IOSH magazine article that ‘In most cases, we don’t have enough reliable data for QRA. Rather than sticking numbers on to categories and mistakenly calling assessments quantitative or semi-quantitative, we should be proud of producing high-quality qualitative risk assessments.’ Risk assessment that focuses on high and low priority allocation of corrective action and descriptive text from hazard assessment rather than numbers is qualitative rather than quantitative. Regarding risk assessment methodology it is Safesmart’s view that you should choose qualitative for a quality risk assessment so not to come across the issues of risk scores in the prioritatsation of corrective action tasks based on over complexity via numbers in a risk matrix structure. INDG163 is the HSE’s legal guidance for completing risk assessments. Regarding HSE legal requirements for risk assessment it is important to remember that there is no required format for risk assessment so long as within the format you can achieve these aspects mentioned in INDG163. On p4 of HSE document INDG163 it’s stated that the hazards identified need to be put in order of importance to address the most serious risks first. By stating simply whether a hazard is normal or high priority it can be clearly and simply differentiated which hazards are high priority. 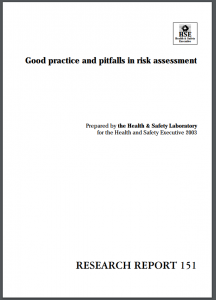 In addition to the HSE’s comments about the danger of using risk scores and a risk matrix the ‘Health and Safety Laboratory’ (HSL) the research arm of the HSE have also conducted research on behalf of the HSE about ‘Good practice and pitfalls in risk assessment’ in the 2003 research report 151 (RR151). There is a lot of research online that criticises the use of a risk matrix and we encourage you to research and read this to understand the issues. Risk assessment risk scores are not simple and as the HSE says themselves ‘could result in applying unnecessary control measures or failing to take important ones.’ The other benefit of keeping risk assessments simple is that they can be understood and conducted by all to help improve health & safety management and awareness across a whole organisation. Engagement and awareness of staff in health and safety is proven to reduce the likelihood of accidents. Does Smartlog have numeric risk score scales, colour coding or a risk matrix structure? No, Smartlog has been designed to keep risk assessment simple and efficient in order help you improve safety quickly. In HSE document INDG163 on page 3 it’s actually stated that ‘any record produced should be simple and focused on controls’. Safesmart believe in safety through efficiency. Smartlog’s qualitative risk assessment structure focuses on actions to improve safety and lower risk. Actions to correct hazards. Rather than having the option to give a numeric score or colour rating for a risk, Smartlog focuses on pass/fail questions with comments & images to ensure compliance and clearly show what action needs to be taken to improve safety via the selection of normal or high priority. Scoring a risk out of 5 for example may mean that lower numbered risks are ignored or forgotten about. As mentioned earlier in this blog post, The HSE write online that ‘Getting this wrong could result in applying unnecessary control measures or failing to take important ones’. Low risk hazards that may or may not have significant severity are still important and Smartlog ensures that all risks are clearly visible putting high importance hazards at the top of the interactive to-do list called ‘due checks & tests’ automatically based on answers to risk assessment questions and the selection of high or normal priority. Based on risk assessment answers, reminders are also sent to remind individuals to take corrective action, there are also reminder escalation levels so seniors are notified if action hasn’t been taken by tasked individuals. When corrective action is taken the due check & test is moved to complete and the risk assessment is updated accordingly so focus can again be on remaining corrective action that needs to be taken. Safesmart’s view is that there is extensive difficulty in determining a score number for the likelihood and severity of risks as it’s a subjective process. As well as creating the issue of lower risk score hazards being forgotten, deliberation over scores can create confusion and waste time when the priority of a risk assessment is improving safety. Evidently time should be spent on this, not deliberating about the scoring of everything with a number or colour. Due to the nature of this subjectivity, discrepancy and difference in reporting by different individuals, issues are inherent in number & colour scoring of risk assessments. This means that compliance monitoring is affected, thus creating the possibility of confusion and misinformed decision as a consequence of scoring. We hope reading this bog post has highlighted the issue of numeric risk scores and risk matrices. If you are still using a risk matrix with risk scores for your risk assessment process we urge you to reconsider and discover Safesmart’s Smartlog software. Our software is designed for fast and efficient risk assessment needed in today’s 21st century management environment that seeks to involve all in improving safety without unnecessary over complication and bureaucracy. Smartlog’s risk assessments are always live, always assigning corrective action and always helping to save lives. This entry was posted in Advice & Answers and tagged risk matrix, risk score. Bookmark the permalink. Both comments and trackbacks are currently closed.